Finding cheap flights to Amsterdam should be no problem. 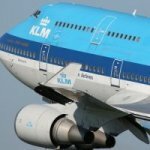 As Amsterdam Schiphol Airport is the 4th busiest hubs of Europe, and the 12th busiest hub world-wide, there are dozens of airlines offering discount airfares to Amsterdam. From the USA and Canada, Amsterdam is one of the cheapest routes to fly into Europe, and from the UK and Ireland there are several low-cost carriers. 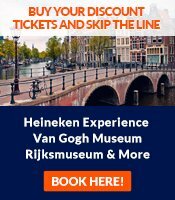 This page gives you tips to find the cheapest air tickets to Amsterdam. Also check our other pages on available flights to Amsterdam from any part of the globe, and our page about airlines specializing in cheap tickets to Amsterdam. There are lots and lots of cheap flights to Amsterdam from many European destinations (and especially from UK airports). So if you're coming from another continent, it may pay off to check if you can split up your journey in to parts: one flight to for example London, and from there a dirt cheap flight with e.g. easyJet to Amsterdam. This also goes for a few US destinations: Dutch low-cost carrier MartinAir has direct cheap flights to Amsterdam from Miami and, with a stop-over, from other US cities as well. For details, look at my pages about key airlines to check for cheap tickets to Amsterdam and my overview of air connections to Amsterdam from various parts of the globe. Amsterdam Schiphol Airport is the most convenient airport for Amsterdam city trips. But also have a look at flights coming into other (much smaller) Dutch airports: especially Rotterdam, Eindhoven or Groningen. With the excellent train connections to Amsterdam, you'll be in the city in a few hours. And it's especially some low-cost carriers that fly to the other Dutch airports (e.g. RyanAir that uses Eindhoven for many European destinations and Transavia that uses both the Eindhoven, Groningen and Rotterdam airports). Hundreds of airlines fly to Amsterdam. On some routes, you can choose between a dozen airlines. That's why it pays off here more than anywhere else to compare, compare and compare some more. Be sure to check our list of key airlines with flights to Amsterdam. Flights to Amsterdam will become more expensive as the date of departure comes nearer. That's why it makes sense to book early - six to twelve months in advance usually gives the best deals. That said, days or even hours before departure, the prices also drop considerably since an airplane seats is essentially worthless as soon as the plane is airborne. Amsterdam is an all-year round destination, but most tourists come between April and September. Prices will be higher then. Prices are especially high during the European school holidays in the Summer, which are usually somewhere between the last half of June and the first half of August. The same goes around Christmas and New Year. Avoid those seasons if you want to get the best deals. The other advantage is that there are more hotel rooms available (Amsterdam hotels are often fully booked in the summer holidays), and you will avoid the tourist crowds. Most people prefer to fly during day times. Consequently, flights leaving very early in the morning or late at night will be cheaper. Moreover, people who go on holidays typically leave and return during the weekend. So flying on weekdays is cheaper. Mondays and Tuesdays are often the best. Do include a weekend in your itinerary, though, or the airlines assume you're a business traveler and prices shoot up. If you follow all these tips, you may find more cheap flights to Amsterdam than you can handle!